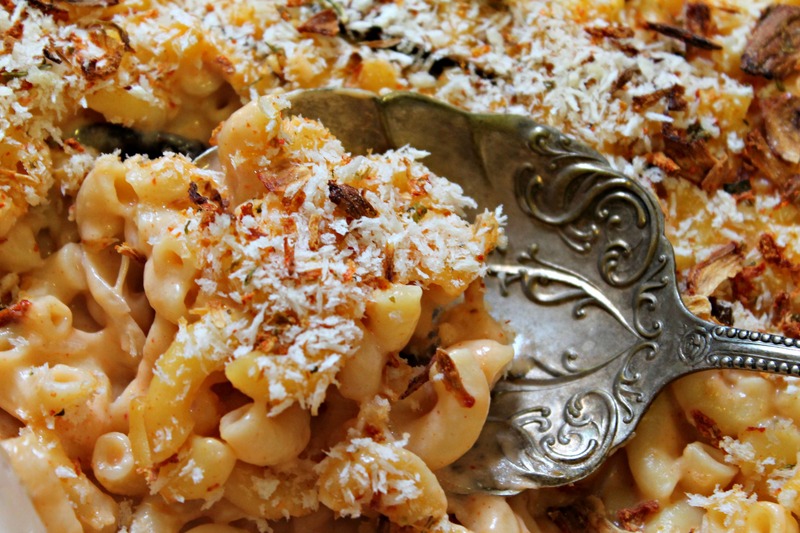 If you’re a macaroni and cheese lover, today is your lucky day! A group of food bloggers and I have teamed up to bring you some of the best mac & cheese recipes – some of the best I’ve ever seen! Plus, we’ve got some great sponsors and giveaways just for you! Welcome to MAC & CHEESE MANIA! Welcome to Mac & Cheese Mania, hosted by the lovely ladies Brandy of Nutmeg Nanny and Rachel of Rachel Cooks. Along with a few of your favorite bloggers (myself included! ), we’ve come together to each share a delicious and irresistible recipe for macaroni and cheese. When I first signed up for this, I thought I’d go the Latin route and make something with Caribbean spice in it. But after visiting my best friend and stocking up on Korean ingredients from her local market, I decided to ditch the Latin and go the Korean way! Thus, I present to you: Korean Macaroni and Cheese. 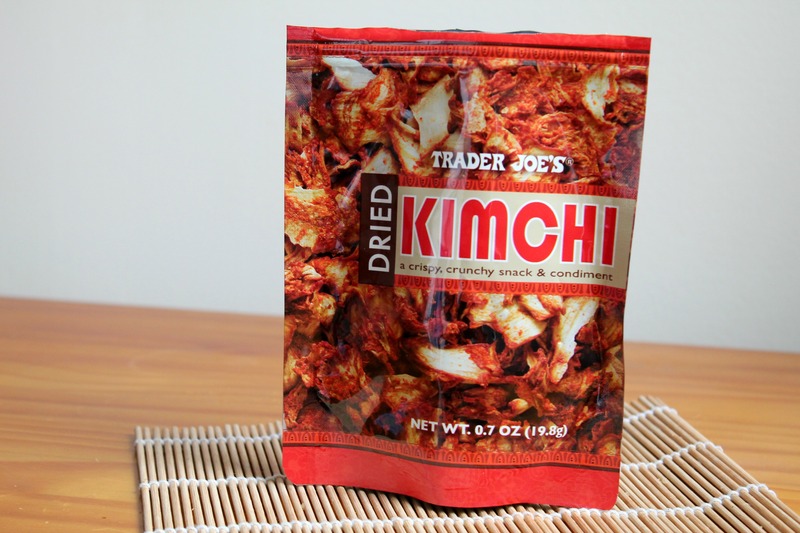 dried kimchi & panko crust: you heard right, dried kimchi! It’s just like the fresh version, only dried to a crisp. Blended with panko (the Asian breadcrumbs), it creates a delectable crust unlike any other! (not a Korean favorite but…) Cabot Seriously Sharp Cheddar: this is what makes this such a luscious dish! The sharpness of the cheddar plays off the spiced gochujang and brings this dish together! Isn’t your mouth watering already?! If you’re a lover of Korean food, I’m sure it is! Now, please make sure to head on over to Nutmeg Nanny and Rachel Cooks – they’re the hosts of this fun event and giving away tons of prizes, including: Door to Door Organics Gift Cards, OXO Gift Baskets, Zak Designs Prize Pack, a year’s supply of Cabot cheese, a Vermont Creamery gift basket, a risotto kit from Marx Foods, Barilla pasta, Anolon Advanced Bronze 4.5 Qt. Tapered Stockpot, Rachael Ray Stoneware Casseroval, Wusthof CLASSIC Studio Block Set, Microplane Graters and Kitchen Tools, a SavorX Starter Block with spices and Le Cordon Bleu by Swissmar oven to table roasters. All giveaways open to US residents over the age of 18 only. A Korean twist on a classic American comfort dish! Preheat oven to 400F and butter a large casserole dish. In a large pot over medium high heat, sauté the onion, garlic, and mushrooms until the onions are translucent and the mushrooms lose some of their water. Add butter and flour to coat the vegetables and cook for 3 minutes. Add milk and whisk to avoid lumps forming from the flour. Season by adding your hot sauce or Gochujang, as well as salt to taste. Stir in shredded cheese and dump in cooked pasta. Coat pasta and place in casserole dish. Top by mixing panko with crushed dried kimchi and bake for 15-25 minutes. If you can't find Korean hot pepper paste, substitute for the ever so popular Sriracha! 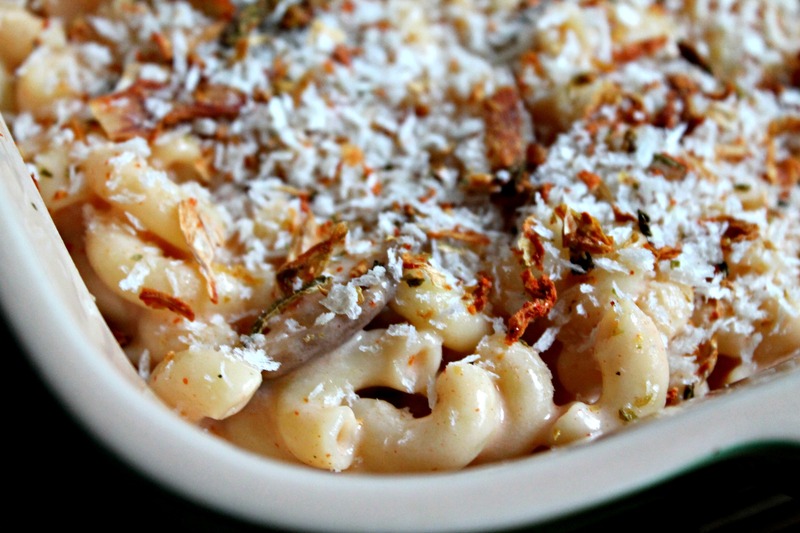 Disclaimer: Mac and Cheese Mania is being sponsored by Door to Door Organics and OXO, so be sure to check them out! Thanks for supporting companies that allow us to share delicious recipes with you all! Love the Korean twist – Easy to put together but should start with 1 teaspoon salt! I made with 1 tablespoon and it was a bit too salty. This is such an interesting idea!! Will definitely have to keep my eyes peeled for that gochujang! I love cheese and anything relating cheese. The pictures is very tasty, very great. Thank you! This is one gorgeous mac n cheese. And can I just say that serving spoon is beyond gorgeous. I love the fun twist! I never would have thought to go Korean with mac n’ cheese, but it sounds incredible! This looks so phenomenal, Nelly! Loving all the flavors you put in. Thanks for helping us kick off our event! oh my gawd, I LOVE this!!! freaking brilliant. . can’t wait to try this! I’ve been so excited to check out this recipe since I first saw your link! Way creative! This is such a unique Mac and Cheese idea! Love it!